Mission Specialist Peter J.K. Wisoff stands on a Portable Foot Restraint, Manipulator Foot Restraint attached to the End Effector of the Remote Manipulator System on June 25, 1993. 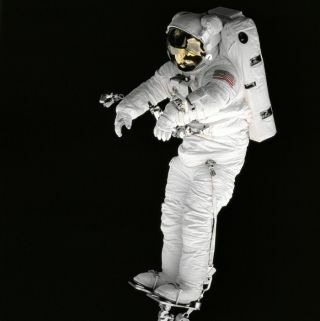 In this historical photo from the U.S. space agency, against the blackness of space, Mission Specialist Peter J.K. Wisoff, wearing an extravehicular mobility unit, stands on a Portable Foot Restraint (PFR), Manipulator Foot Restrait (MFR) attached to the End Effector of the Remote Manipulator System (RMS), colloquially known as the "robot arm." Wisoff is being maneuvered above Endeavour's payload bay as part of Detailed Test Objective (DTO) extravehicular activity procedures on June 25, 1993. DTO results will assist in refining several procedures being developed to service the Hubble Space Telescope on mission STS-61 in December 1993. The Earth's surface and Discovery's payload bay are reflected in Wisoff's helmet visor.